1. With Office Computer(s) – Students copy their scores to the tear-out coupon on the last page of their workbook. School staff enters everyone's data and batch-prints job reports for distribution. 2. With Computers in a Library - After self-scoring their workbooks, students enter their own data and print their own job search results. 3. In Classrooms and Labs – After self-scoring their workbooks, students match their personalities to careers in a lively group exercise. 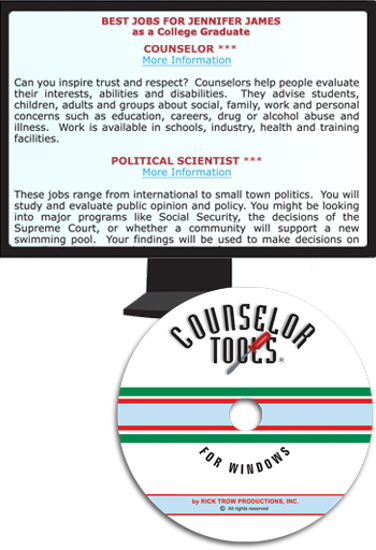 Converts workbook scores to jobs at incremental educational levels from less than high school to college plus / Supports both Explorer and The Career Game workbooks / Operates in limited student mode or password protected counselor mode / Sorts and classifies by interests, educational goal and your own custom codes / Reports can be individualized to include a general message from counselor or institution plus a personal note to each student / Main screen continuously cycles a library of famous quotes about careers and education / Building site licensed / Supports all Windows networks. Registered Users can order the 2018-19 Update for $69.00 HERE.